Place patients at the centre ensuring information crosses boundaries. Build better, safer tools through human centred design. Enhance clinician engagement optimising the safe use of digital systems. 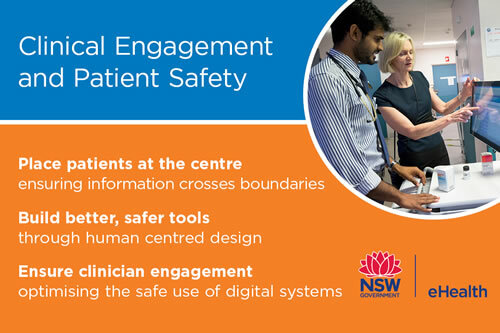 eHealth NSW’s Clinical Engagement and Patient Safety team seeks to improve the usability, usefulness, safety and efficiency of our digital solutions for clinicians by seeking their input and providing analysis, advice and design support. To deliver meaningful innovation and enhancements to digital solutions, eHealth NSW is engaging NSW Health clinicians and being guided by their ideas, experiences and expectations. This is steered by the Clinical Engagement Framework, which provides a model of engagement to allow the participation and involvement of all clinicians across NSW Health. 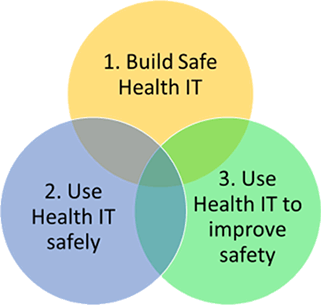 The Clinical Engagement and Patient Safety team oversees the Patient Safety and Quality Framework for eHealth NSW, which ensures we build better and safer tools for the clinicians providing care to patients. This service provides a central access point to obtain knowledge for the whole NSW Health system regarding digital solutions, health informatics and policy, including new knowledge generated by other services and agencies. The service monitors current market trends and looks ahead to ensure readiness for future requirements. It reduces duplication of effort by allowing teams to leverage the progress of others and create opportunities for mutually beneficial collaboration. Human Factors analysis and User Centred Design principles can help enhance software interfaces including those in the early stages of development and those being used in NSW healthcare settings. Techniques employed by this team include user experience research, user-centred design workshops and observed practice sessions, some of which involve clinicians collaborating to sketch their ideal clinical software structures and user interfaces. This yields unparalleled clinical insights and opportunities to improve the use, functionality, quality and safety of digital solutions. This service exists to support a new clinical solutions design governance for NSW Health, ensuring consistently high standards of usability, usefulness and safety. Your questions, ideas and suggestions provide valuable insights which guide the work of the Clinical Engagement and Patient Safety team. Please email the team on eHNSW-CEPS@health.nsw.gov.au or call (02) 8644 2485.